In order for your customer or user to know you care and, frankly, to avoid wasting valuable company and personal time, you must follow several important rules when communicating via email. Use a descriptive and specific subject line that will help you and the user identify this particular email conversation in the future. Many support ticketing systems automatically add a ticket number. If yours doesn’t, consider adding a ticket number manually. 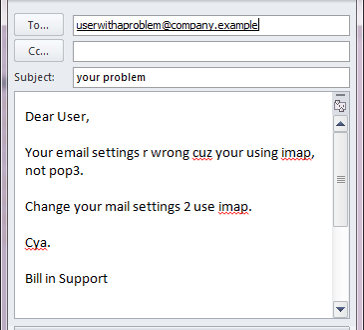 Personalize your response by including the user’s name. Never assume that the customer or user has a particular level of knowledge. It is much better to be too thorough than to omit necessary steps because you assume the person receiving your email already knows something. Anticipate related issues that the user or customer might have and include links to support pages or, if necessary, steps for the recipient to follow if she encounters any related issues. Bullet-point your response to make it easier to read. Long paragraphs are difficult to read. It’s easy to miss interior points buried in lengthy blocks of text. Additionally, show professionalism by proofreading for meaning, spelling, grammar, and mechanical errors such as repeated keystrokes or incorrect spelling corrections (just get in the habit of re-reading every email completely before hitting the send button). Use emoticons to express or to clarify emotions (but be careful about their overuse). Also be sensitive as to who will be reading your email. You probably wouldn’t, for example, put a smiley face in an email to the CEO or other C-level executives of your company! Ensure your contact information is included in every email. 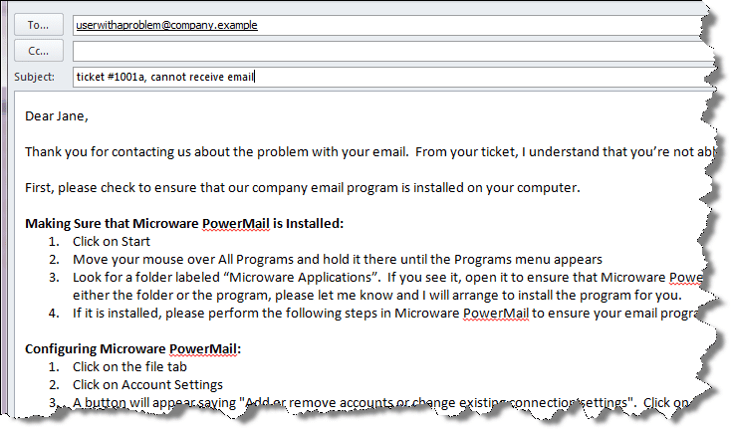 Automated signature features in most email programs make this easy. Include your name, phone number, email address, office hours, and appropriate links such as your company or department website, support pages, and any work-related social networking sites such as LinkedIn. Now, let’s take a look at some bad and good email examples. 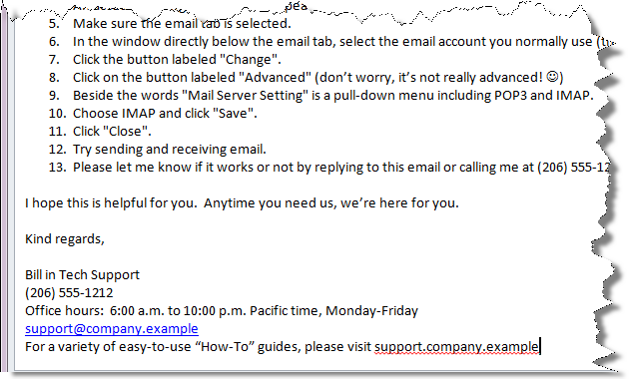 Notice in this example how the support person seems to take a cavalier attitude toward the user and her problem. He displays unprofessionalism by using abbreviations, poor grammar (spelling “your” when he means “you’re”), assuming she knows how to make the change to IMAP, and not providing contact information. Providing a website with additional information. Business runs on email. Sure, other forms of communication are in use all the time, but email is still the most common means of communicating, not just with customers, but also with colleagues in the workplace. The rules we’ve just gone over are really about treating each other with respect and empathy and not wasting each other’s time. When we follow the rules we help everyone, including ourselves, get the job done in the most efficient manner possible.